We are now very close to delivery deadline to get T&T out on the retail shelves on time. Final tweaks and optimizations are still under way, as people who participate on the GetLocalization effort can witness with changes in the game texts every few days. 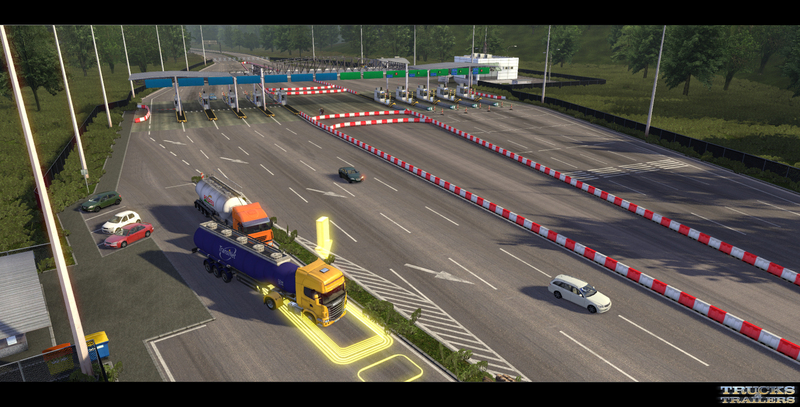 People will like this scs, prepare for a spam of: OMG BEAUTIFUL PICS GONNA BUY ETS2 AND T&T !!! Anyway good job, love to see people sitting in the tollbooths and AI vehicles driving through them as well. Truck & Trailer is now available which will be very welcome I have already. Maybe an english demo pls? Okay, no profanity needed, the models are great for god's sake. The pictures are all beautiful. Merci pour toutes ces bonne nouvelles ! Will I be able to run it on P4 2GHz, 768MB RAM and a x1600 GPU? 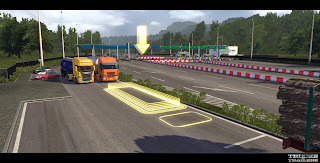 But is that in ETS2, the toll gates will be animated? Because apparently in T & T, it suffices just to pass, but it will not stop and pay. I hope that in ETS2, tolls will be animated. Best of luck! Everything looks really nice! Good job, I love the new prefabs. The cars is too small on the road, it's unrealistic, and they the look like a matchbox cars! I don't like it, i'm very disappointed! Wonderful screenshots. Looking forward to the release very much. I think that the bit is extra. To all SCS and hockey fans from Finland (I bet there are lots of them): Congrats to win world championship - all the best from Czech Republic! Yes, the cars is too small on the road! Please fix this, because it's very unrealistic! Will be Croatia included in countries? No. T&T is a skill oriented game, confined to limited scenery. Yes, the game is one of the biggest fault in the wrong aspect ratio! And so it will be released?! What's wrong with the aspect ratio? That's adjustable via "screen resolution". The size ratio is horrible! whats the problem with greek language?it was validated,i was the one who translated the last word at greek and i remember that it was on validation status!now why it is not?it is translated by greek guys,where will you find better translation than this?you think that there is anyone else that knows better our own language?our mother tongue?for god shake..every word was perfect translated. 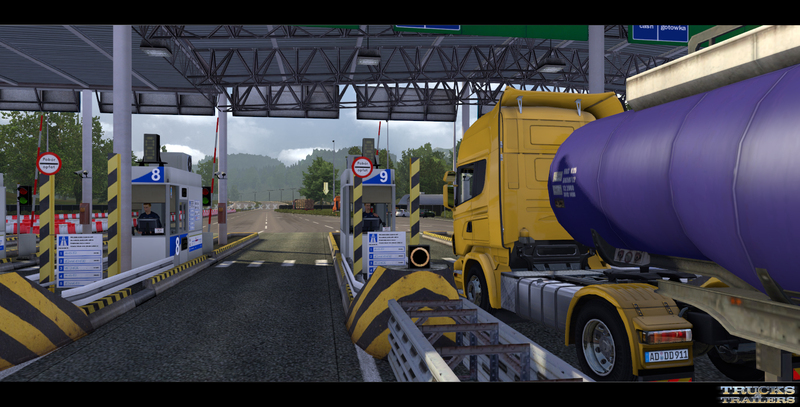 Detailed environments will definitely be a forte of T&T - let's just hope that these assets will turn up in ETS2 as well. 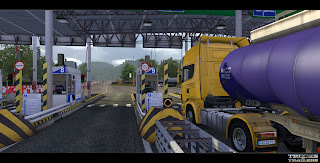 Also, I really do hope that players will actually have to stop at borders and toll gates for inspection or paying the toll in ETS2 - it was a nice feature of the 18 WoS series, I would love to see it again. @Chris: When did it go back to WIP status? Don't forget that strings are added or modified every now and then nowadays, so it is more than possible that you have to re-translate some modified entries. We had to work on the Hungarian translations too on the weekend, as 5 new entries were added on Saturday as far as I remember. So you're talking about object size, not aspect ratio. Aspect ratio is the ratio between the width and height of the screen. About the size of the cars, you should also examine it in relation to the size of the truck. If that's also wrong, then it's a problem with the cars, only. If not, then the height of the plastic barrier should be adjusted. The discussion regarding lane widths already received an answer from SCS. Excelent work guys!Greetings from Greece! very nice ...great great job!!! Honestly - and it's not about whining or not - but the sizes are indeed far too unrealistic, and no explanation can save the day. It is a step backwards, and I did not expect it from SCS. I agree, the game looks AMAZING, indeed, and this is why I am disappointed about the absolutely false measures, sizes. Call it aspect ratio or whatever, the fact is that it's awful. I hope that the guys at SCS will revise this. The object size ratio is awful! Unrealistic and this destroy the gameplay feeling! LOOK THIS PHOTO SCS SOFTWARE PLEASE! No he is right ! Les gens se plaignent beaucoup trop pour pas grand chose .. arrêtez un peu ... ! On peut pas tout avoir ok !! DAF XF95 380 s'il vous plait !!!!! Please remove that yellow arrow and destination sign on harder difficulty. You can show it in beginning where the task is given, but please remove it during the actual driving. It is very unrealistic and kills the realistic immersion. Is Trucks and Trailers out?? please let know anyone?! Why the hell are you people (well, some of you) always complaining about some stupid stuff? There is nothing wrong with car size. It's not even important if cars are bigger or smaller (and they aren't smaller). Anonymous that complained AND said "you r right" in next comment is the same guy/girl/g..
BTW, SCS these screens are wonderful! Thank you! And how on earth will you know where to park??? SAlutation de la france!! Tres bon travaille!! Mois est mes amis Francais on se demande quand on aura enfin la datte de sortie en France de ce superbe jeux????????? On s ait deja la datte de sortie en pologne mai pas en france!! Je vous en pris donner nous la dotte de sortie en france!! Why can't people stick to English? What's the point anyway of writing something that the majority doesn't understand? Use a translator like Google if you can't write it in English. No one cares if it's not perfect. We just want to understand the text without to have to translate it first. So please, stop being so arrogant. if this is google again you need to speak to them because this is getting behond a joke! PS, whens the english version of Trucks and Trailers!! or is it all same date, even better just tell us the release date! yeah,we are all getting tired,I mean every body in iran! what do you think about "western farsi(islmic republic of iran)"
Royal Falcon:to you. They have posted the relase date earlier. The date is 20 june. What about the language. If you translate it youreself you can get it in the game. Press fallowing link and add youre language. Like I mentioned in the beginning, "you can show it in beginning where the task is given". 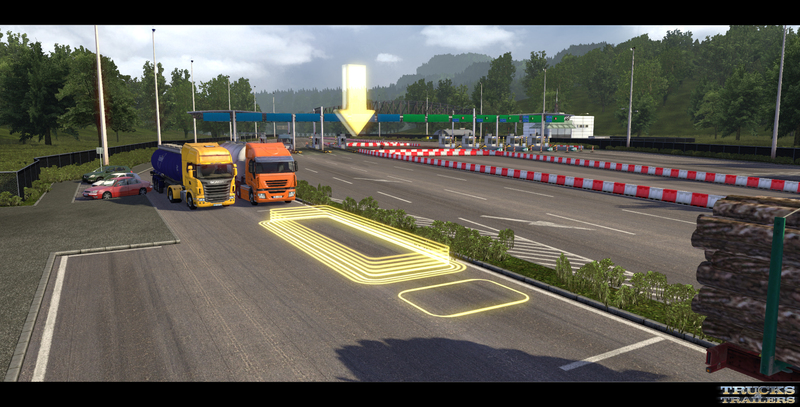 Also, if there needs to be something during the actual drive, there could be a realistic mark on the ground, like a yellow painted area instead of this hovering unrealistic big arrow and box. For the hardest difficulty, I think it would be enough to have the destination shown in the beginning when the task is given, and that should be enough. For those who want to see it all the time, they could always choose easier difficulty with less realism.